Emily's Recipes and Reviews | UK Food Blog | Leicestershire : the fat fox inn, watlington. the fat fox inn, watlington. Found in the charming village of Watlington, The Fat Fox Inn is an independent restaurant, pub and B&B brimming with local character. Rustic rooms and cosy communal areas make up a welcoming atmosphere which blends old and new. Whilst the restaurant has a classic and homely feel, with a somewhat regal touch, brought about by statement wallpaper, antique style furniture, large patterned rugs and tall candlesticks. The Fat Fox Inn has nine bedrooms, a handful of which are found in their courtyard. This is where we were placed, in a double en suite guest room with prices starting at £95. We stayed before Christmas, where the toasty pub and warmed bedrooms were very welcome on such a festive (but very rainy!) evening. 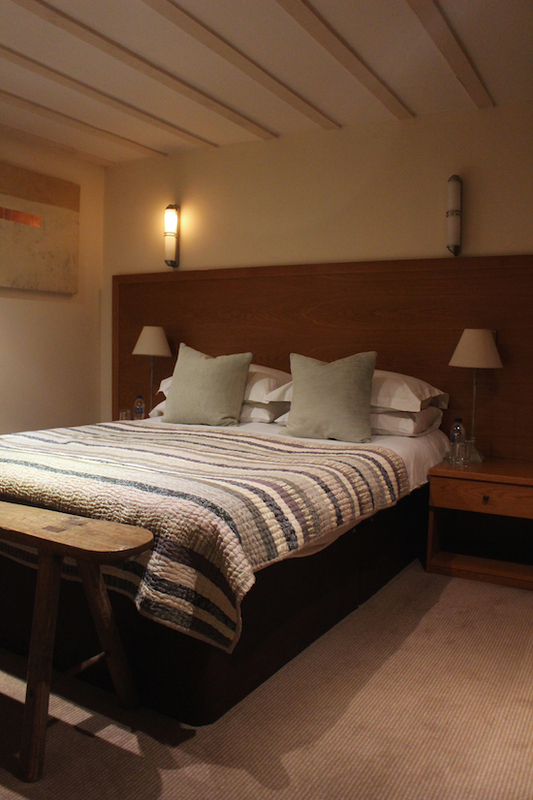 The room was lovely and clean, with wooden features and a snug throw. The bathroom was a little outdated, although similarly clean and stocked full of bathing products. After a little walk round the village and stop at a couple of local pubs, we came back to get ready for the evening. We were met with fairy lights and a roaring fire which of course continued the welcoming atmosphere. With a bottle of Pinot Grigio (classic Emily) and a local beer, we began with starters of The Fat Fox Scotch Egg (£5) and a Root Vegetable Broth (£4). Warming pub grub was just what we needed! The dishes were well presented, suiting the theme of the cosy interior, and the portions were generous. The broth came with a warm, cheese bread which mopped up the flavoursome soup in minutes. The scotch egg had a satisfying gooey yolk encased in a well seasoned pork and breadcrumb coating. We were off to a good start, and at pretty reasonable prices too. For mains, we opted for The Fat Fox Cheese Burger (£12) and a special of wild hare tagliatelle. Having never tried hare before, I thought this locally sourced game would be the best place to start. Chatting to the manager, he explained how they had only been shot a few miles away and prepared at a local butchers (sorry veggies!) Their sample mains typically ranged from £10-14, with steaks coming in at £16. Example vegetarian dishes included a golden beetroot tart tatin and goat's cheese with a curly endive salad (£12) whilst seafood lovers could enjoy pan seared skate with roast garlic dumplings, mash and lemon cream sauce £14. Sides are reasonable too, coming in at around £3.50 each. Gluten free diners will also be pleased to know that there are often risottos, potato dishes and pulses on the menu. Again well presented on a lovely wooden board (lucky they wouldn't fit in my handbag...) the burger was juicy and generous. With a bouncy seeded bun, the burger lived upto its homemade appearance and ticked both the tasty and rustic boxes. It came with a crunchy fresh slaw and skin on chips, which were well seasoned. It wasn't served pink like some burger fans would appreciate, but this is a matter of opinion and the meat was still packed with moisture. The hare dish was a great introduction to local produce too. Very rich indeed, the sauce was bursting with fruity tarragon, red wine and slow cooked vegetables. The delicious ragu was very flavoursome and filling, having to take a break now and again to appreciate the rich flavours even when fun. It was like indulging in a few scoops of ice cream, and then not being able to resist going back to eat the whole tub. (We've all been there). That said, there's always room for dessert. My dining partner went for the lemon and almond roulade whilst I opted for a dark chocolate mousse with Baileys ice cream. Both desserts were dutifully devoured, with pretty presentation and a good size to round off the meal. The dark chocolate was particularly inviting, with a bitter edge that was just the trick for a final course. Other sample desserts on their everchanging menu included pannacotta and rhubarb (£4), spiced bananas and cardamom ice cream (£4) and blackberry parfait (£5). Overall it was a delicious meal that I feel deserves more credit than just pub food. The venue is definitely a restaurant in its own right, with lots of culinary skills that would have gone into the dishes. To top it off, the staff were lovely and couldn't do enough for us or the other diners. After a comfy night's sleep, it was time for breakfast. There wasn't much on the menu other than the classic mix and match breakfast options, and I felt a bit of inspiration could have been brought to the table. For example, dishes of kipper, salmon, omelettes or vegetarian ideas that reflection the excellent thought and presentation from the night before. In all though, our freshly cooked breakfast was delicious. Perfect eggs and great produce yet again. Thumbs up all round. With coffee, juices and newspapers at an arm's reach, we couldn't complain. Also hooray for lovely morning lighting - what a shame I couldn't have captured the dishes in the same way by candlelight. Have you been to The Fat Fox Inn? Where are your favourite places to stay in Oxfordshire? We went on to enjoy a day out in Oxford, such a lovely city with lots to do. We dined and stayed as guests of The Fat Fox Inn. All words, photography and opinions my own. vegan coconut shortbread with chocolate drizzle.